Although it was still snowing it was very heavy and wet, the first short red run had people strewn across it and 2 ladies had taken off their skis and were walking back up the slope. Went up to the mid station with fingers crossed – not much better. Called it a day after 2 runs because it was break a leg territory. I will ski in most conditions but yesterday was just horrible. Chatting to a couple of ski instructors and they said “we wouldn’t be out if we didn’t have to be”. This morning it’s blue skies and mild temperatures so I’m expecting spring conditions. Due to turn colder in a day or two and some snow due mid week. Real spring conditions yesterday with blue skies, mild temperatures and heavy snow but it was a lovely day. Played a little in Flaine then did a tour of the villages when the lift queues started to get longer – that worked really well. Cooler today and due to snow later so fingers crossed for tomorrow, the heavy mess of last week can’t happen again, can it ? oldtennishoe, did you go to Glenshee on Saturday? Saturday at Glencoe was a day of poor visibility and constant snow which made for some hilarity. Sunday at Nevis Range was slightly better but when the sun made an appearance in the afternoon it was top notch! Is it too much to ask for it to stick around until next weekend? No, I didn’t bother in the end. The weather here (Perth) was thick heavy wet snow with low visibility. Sunday looked better, but I couldn’t face the queues. If I wasn’t heading back to Italy in the easter hols, I may have been more motivated. Beautiful day in the GM, the balcony was -9 at 7am with blue skies and hopefully crisp snow. Should have one more day of cold temps then it’s warming up for the weekend. Yesterday was good fun too although I managed to stack it in a compression I’d failed to see. My new skis – after a shaky start I think I’m going to like them. They do require effort to get the best out of them but they have been great in powder, stable yet responsive. They also have really attractive graphics and a brushed finish to them (which I’m hoping lasts well). @GrahamS – I be tempted to get some base cleaner to remove dirt, grease & contaminants etc. I’ve had good results from Dakine’s base cleaner and Holmenkol’s. Both are fairly widely available, not really expensive and last for years – you don’t need to use it everytime you wax. I did once try some bike chain citrus degreaser and it made a bit of a gooey mess that just made for more cleaning. So my 10 year old Patagucci Primo Down ski jacket is looking a little tired (broken zips and cuffs). Looking for suggestions for potential replacements. Although potentially not fashionable I’m looking for gore-tex, tough wearing face fabric, some sort of insulation (down, primoloft) and a removable hood. I’d get another but I don’t like the current colours. Norrona is lovely kit, I bought my other half a pair of goretex narvik pants for £100 and they have been fantastic. They are working hard on making things ethical and responsibly sourced too. It is expensive though – but there is an outlet tab to have a look at previous years kit (click on the gender tab then the outlet tab is the last one). I think you have to register with them to be able to see the prices and order from this. They also do free delivery and returns to the UK, not sure about Canada. Jottnar are also having a 20% off deal a the moment too and I do like the look of some of their kit. Well, we only have 1 more day left of our season and it was a powder day with about 30-40cm falling through last night and today. It was great skiing and I am thoroughly knackered. It’s due to stop snowing soon and tomorrow is supposed to be sunny with freezing point about 1800m so hopefully it’ll be a bluebird morning in the powder. To anyone who’s coming to the Grand Massif at Easter I think there should be enough snow to get you to the end of the season. If you are coming out on Saturday and staying in Flaine then Le Pre (next to the DMC) are having an end of season BBQ …. Coming to the end of a week in Cervinia & Zermatt. Excellent conditions at the beginning of the week, snow yesterday and today. 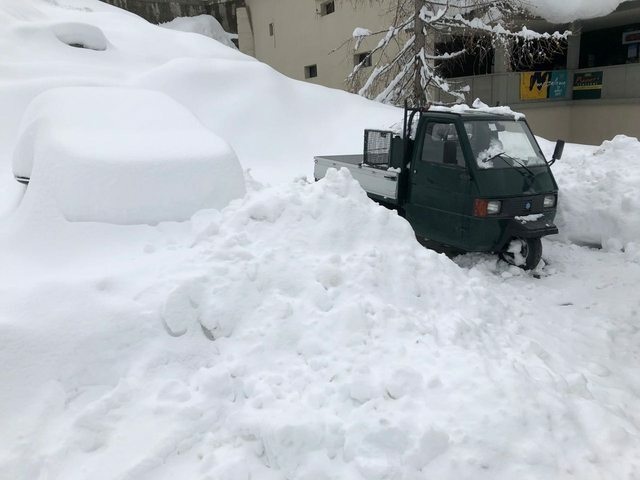 50cm fell last night – that’s my hire car next to the Ape . Should be up for a good final day tomorrow. 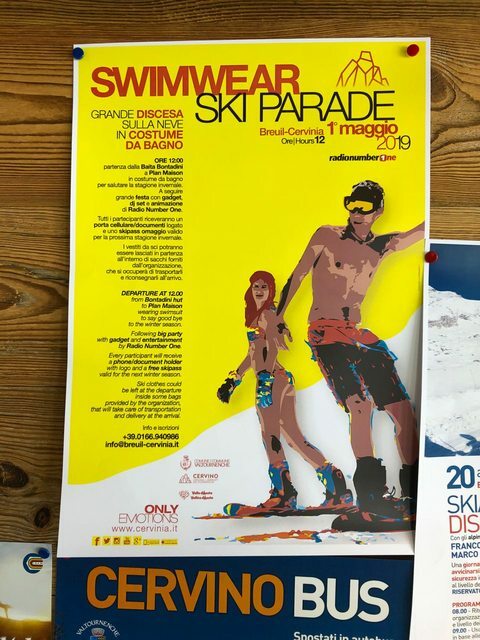 I’m tempted to come back for the 1st of May – ski down in your swimming shorts and get a free list pass for next season! Coming to the end of a week in Cervinia & Zermatt. 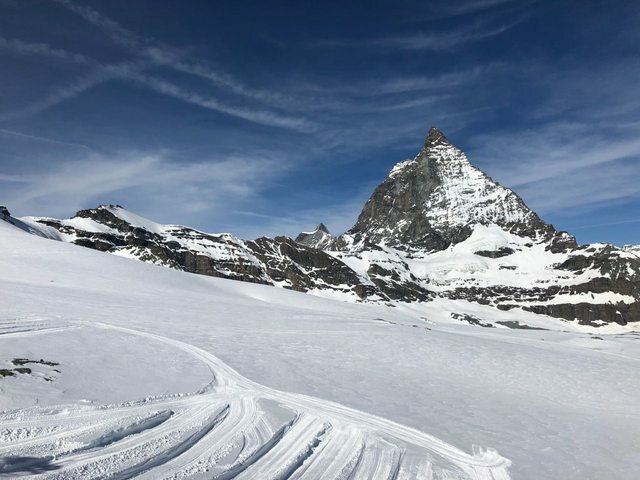 Stay BoardingBob – conditions like that are to be the made the most of…..
I’m suffering from ski withdrawl today – probably not helped by all the ski kit dotted around the house getting aired out prior to being put away for this year. Drive back was painless – left resort at 9.10am (would have been earlier except for the Belgium **** who parked in front of the garage so we couldn’t get the car out). Made a huge amount of noise with no response and Ended up going into the chalet next door (it was unlocked) searching for the van keys (which I found). We got home at 7.10pm. Lots of traffic going down to the Alps but quiet in our direction. I ended up using that on two boards and two sets of skis. Just a liberal spray, scrub down with a dish sponge, then hosed off with plenty of clean water. Left all the bases clean and thirsty for a good wax. Possibly not the best solution but worked well. Off to Kitzbuhel on Saturday for the Easter break. 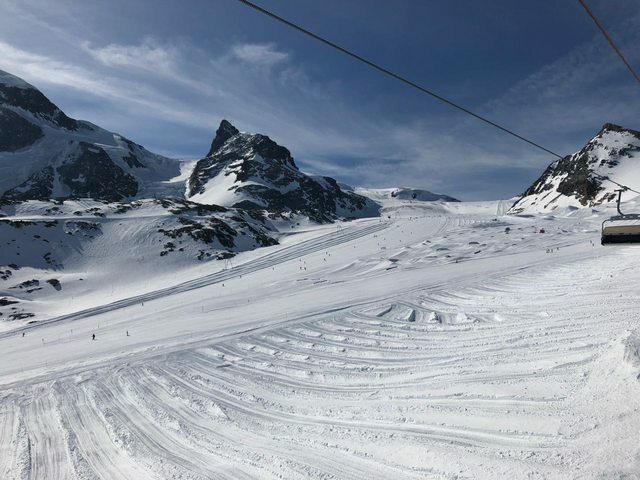 Hoping for some spring skiing – though the conditions are not looking that fantastic at the moment (runs closed, light rain and snow level way above max altitude). Fingers crossed.